YANGON—Looking to arrest a two-year decline in foreign investment, the government plans to hold a summit targeting investors from East Asia before the end of the year, a senior economic official said. “We are open to all countries are who eager to invest in Myanmar. But our main focus this time is East Asian countries,” U Than Aung Kyaw, deputy director general of the Directorate of Investment and Company Administration (DICA), told The Irrawaddy. The Myanmar Investment Commission (MIC) and the Union of Myanmar Federation of Chambers of Commerce and Industry (UMFCCI) expect to hold the summit in December, according to DICA. “Our investment policy has turned to the East,” U Than Aung Kyaw said. Among the East Asian countries and regions Myanmar is wooing are China, Hong Kong, Macau, Japan and South Korea—some of which are already among the largest investors in the country. U Than Aung Kyaw said Myanmar’s ASEAN neighbors offer a model for the policy, as many of the bloc’s member countries now source most of their foreign investment from East Asia, rather than the West. “Most ASEAN countries receive more investment from the East. That’s why we expect more from them,” he said. Recently, the EU Trade Commissioner threatened to withdraw trade preferences from Myanmar due to human rights violation in Rakhine State. Experts have warned that the move could leave more than 400,000 garment workers without jobs. Under Daw Aung San Suu Kyi, the government has launched several major efforts at economic reform, including the Myanmar Companies Law, which offers privileges to foreign investors and has made business regulations more efficient and effective. Despite these initiatives, however, the country has been mired in a chronic economic slowdown since 2016. A UMFCCI survey for the second half of this year showed that all economic sectors are in a downturn. Foreign direct investment in Myanmar declined significantly to USD6.6 billion in fiscal 2016-17 from USD9.5 billion in 2015-16 as Western investors were turned off by damage done to the country’s image by the Rohingya crisis in Rakhine State. Last week, the MIC launched the Myanmar Investment Promotion Plan (MIPP), a major initiative that aims to attract more than USD200 billion in investment from responsible and quality businesses over the next 20 years. MIPP projects are expected to receive USD8.5 billion from fiscal 2021-22 to 2025-26; USD12.3 billion from 2026-27 to 2030-31; and USD17.6 billion from 2031-32 to 2035-36. According to MIPP, the government aims to raise Myanmar’s ranking in the World Bank’s Ease of Doing Business Index to within the top 100 by 2020. Myanmar ranked 171st this year. Looking at some of the country’s ASEAN neighbors, Laos ranked 141st, the Philippines 113th, and Cambodia 135th. The MIC has engaged numerous East Asian countries with its investment promotion activities, including Japan, Hong Kong and South Korea, according to DICA. “We are doing investment promotion activities [with East Asian countries] in a rapid sequence. We plan to go to China soon,” U Than Aung Kyaw said. In September, the MIC also held a meeting with the Japan Chamber of Commerce and Industry, Myanmar with the aim of attracting more investment from the country. 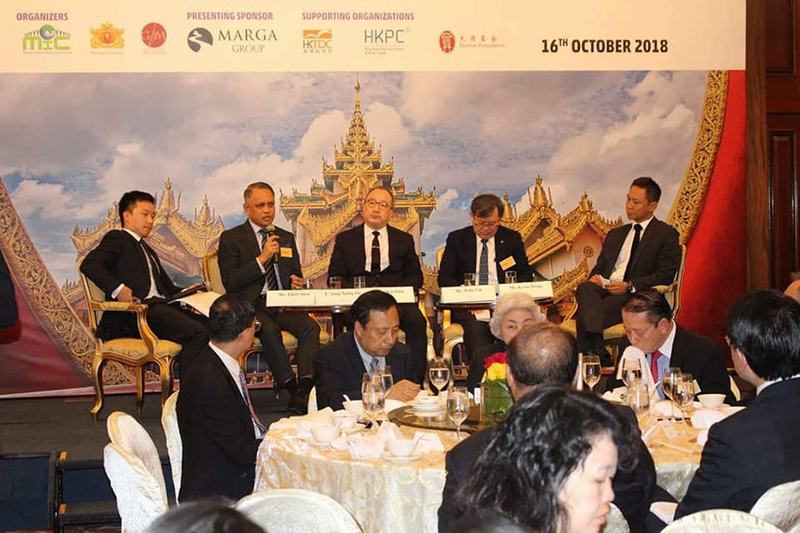 On Tuesday, an MIC team organized investment promotion activities in Hong Kong, at which MIC president U Thaung Tun explained Myanmar’s current economic reforms, the Companies Law and various investment opportunities to the Hong Kong business community. U Thaung Tun met with Hong Kong chief executive Carrie Lam to seek investment in Myanmar’s tourism sector, and also to get support for infrastructure management, vocational training and capacity training from the Chinese Special Administrative Region. Meanwhile, U Thaung Tun and DICA director general U Aung Naing Oo are attending the 23rd Macao International Trade and Investment Fair in the Chinese enclave. According to DICA, China is the largest investor in Myanmar among East Asian countries, while Hong Kong is ranked at No. 4. In fiscal 2018-19 fiscal year (August-October) the Yangon Investment Commission approved 75 projects in the industrial, hotel and service sectors by investors from China, South Korea, Taiwan, Hong Kong, Japan, Singapore, Malaysia, India and Vietnam.